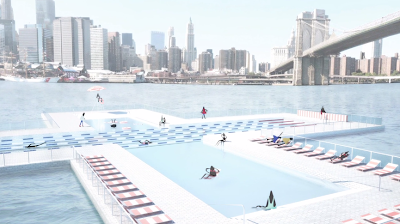 If you've ever dreamt of swimming into a floating-pool in one of the New York City rivers, well—now you can help make that possible. Kickstarter (an online community host that helps find funding for creative start-up projects), has announced their weekly "Project We Love," one of them being our personal favorite: +Pool. The ambitious project is a collaboration between three New York based designers: two are the partners at Playlab (a design firm), Jeffrey Franklin and Archie Lee Coates IV and Dong Ping Wong of Family (a firm focusing more on productive building design). "It was really an incredibly hot summer, and the first thing you want to do is jump into a pool; but as [as New Yorkers], naturally we're surrounded by rivers, and we wanted to jump into them," recollected co-creator Coates IV. And that's how the concept of +Pool was born: "building 4 floating pools stuck together in the shape of a plus," expanded Franklin the other half of Playlab. What's especially great about this concept is that each wing of the plus shape pool, will serve a different purpose. 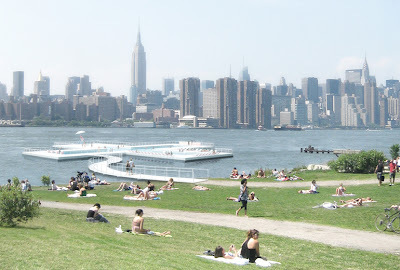 Back in 2008 New York City did fund another floating pool for the summer, but was limited to one shared space amongst everyone—and we all know what that's like: a public pool full of very loud and possibly (potty-untrained) children taking the entire pond of water for hostage—not fun. The Plus Pool project is doing it right this time around: Each wing of the plus sign is specified to a variation of four divergent crowds. The plan will consist of a lounge pool, a sports pool, a lap pool, and yes there is indeed a kids' pool. So far the project has raised $31,000, which is enough to kick-start it with the initial testing of the primary filtration layer. The filtration is the major part of the proposal because the proposition is to take the water from the river itself, filter it completely safe and clean, and use it for the four pools—making it literally swimming in the river, but of course a much more sanitized version. Plus Pool is currently recruiting the much needed help for this very ambitious formula. 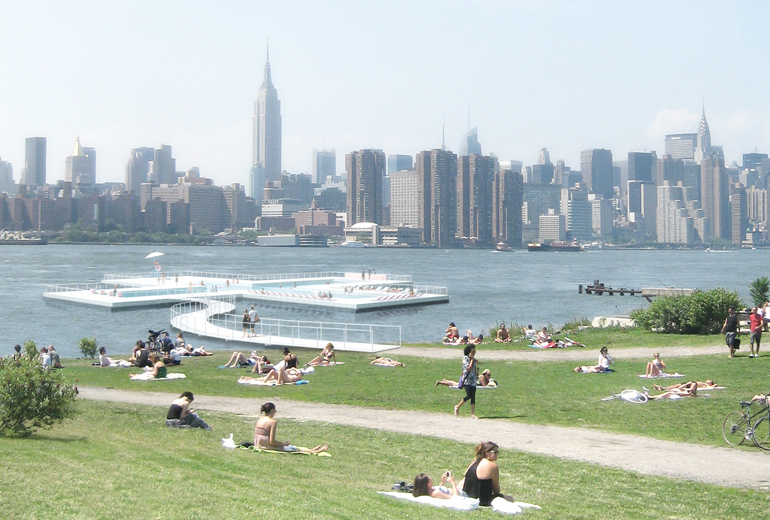 The three designers have enlisted New York's Parks and Recreation Organization, some of the best engineering firms in the city, as well as working closely with New York state's government officials to get permissions and assistance for this wonderful but very complex undertaking. So if you're excited by the future possibility of swimming into the river on a hot summer day here in this glorious New York City, whether you're a native, a resident or a tourist, everyone can really participate in making this happen by making a donation. It can be from $5, (which will get your name on the "Buddy's of the Pool" donor's list), to $10,00,(which will get you a plaque engraved lounge chair with your name on it, a pool tile with your name on it, a +Pool tote bag, pool towel, tank top, beach ball, sunglasses and many more), and you may certainly donate every other amount in-between, (which will get your name on something, plus a+ Pool gift of some sort if it's at least $25 an up). 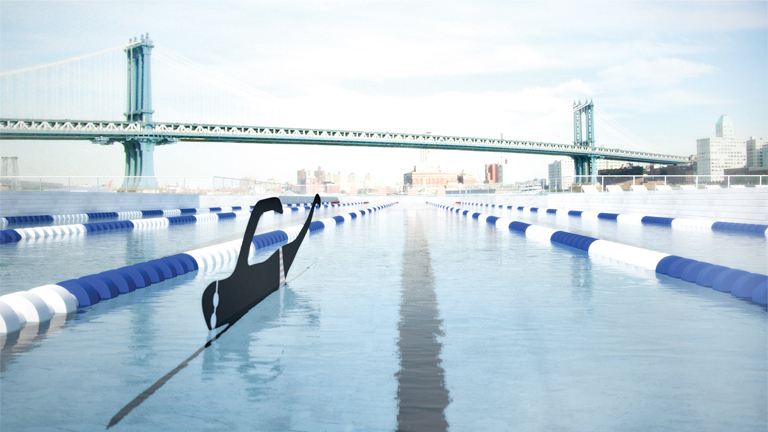 It will take a total of $500,000 to build a mock-up piece of the pool to open the public. Hence, times four, plus some additional expenses to finish it off, our guesstimation is about a $2 million of total cost to build it and keep it up and running to its full potential. We're also guesstimating all the pieces will be installed within intervals depending on the growth of the money raised. The project will have an going funding at Kickstarter until July 15, 2011. 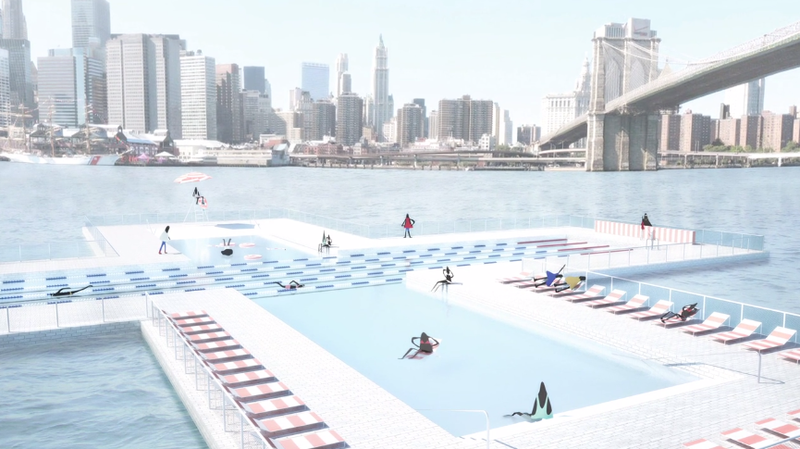 So if you'd like to contribute and if you've also dreamt of swimming or just lounging at a river-pool on a sweltering New-York--summer-day, go to Kickstarter, and donate what you'd like. Go HERE to learn more.